The search for the elusive Baji dolphin is reminiscent of the search, in Lou Ye’s (娄烨) 2000 film Suzhou River (苏州河), for a similarly mysterious aquatic mammal in another river which, like the Yangtze, also passes through Shanghai. This latter fictional search revolves around, not a dolphin, but rather a mermaid—or a mermaid functioning as a stand-in for two women who may or may not have shared the same identity, and who may or may not have drowned in the movie’s eponymous river. The male voice is that of the film’s unseen narrator, a videographer through whose eyes the work is implicitly presented. His interlocutor is a young woman by the name of Meimei (Zhou Xuan), who works in a nightclub swimming in a large tank disguised as a mermaid. The “Mardar” (Jia Hongshen) she refers to is a motorcycle courier who meets her at the club, and who immediately becomes convinced (despite her initial protests) that she is the young woman with whom he had fallen in love several years earlier, and who subsequently (appeared to) commit suicide by plunging into the Suzhou River before his very eyes. The narrator’s appropriation, at this end of this passage, of Meimei’s initial accusation that he is lying, is then inverted in his following monologue, which concludes with the film’s famous tag-line, “my camera does not lie” (我的摄影机不撒谎). Although the videographer initially states this line in the context of his advice that his clients not complain if he portrays them in an unfavorable light because, he claims, his “camera does not lie,” the line quickly becomes a statement for the epistemological dilemma of the film as a whole. While initially framed as a series of POV shots taken from the perspective of the narrator’s own handheld camera, the film quickly shifts to a series of events which the narrator only knows about second or third hand. More specifically, the narrator meets and grows fond of the mermaid-impersonating Meimei, who then tells him how the motorcycle courier Mardar found her and became convinced that she is actually his long-lost girlfriend, Mudan. Meimei quickly becomes captivated by the stories which Mardar tells her of his relationship with Mudan, and it is presumably these same stories (relayed to the narrator by both Meimei and Mardar himself) which we then observe played out on screen. The narrator’s promise that his camera does not lie, therefore, stands in stark contrast to the explicit doubts which the film raises about the reliability of the story of Mardar’s and Mudan’s relationship as it is played out on screen. 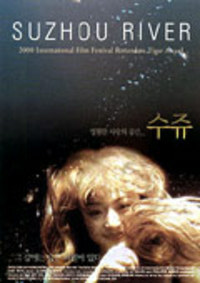 In particular, the film plays with the question of whether Meimei (who is frequently shown in explicit POV shots seen through the narrator’s own video camera) and her putative doppelganger Mudan (who only appears in the film mediated through the second- and third-hand accounts of Mardar and Meimei) are in fact the same person. (Indeed, both characters are played by the same actress, Zhou Xuan). The potential unreliability of the embedded Mardar/Mudan narrative is suggested, for instance, in the film’s nod to such well-known examples of films framed around unreliable narrative views, such as Jiang Wen’s In the Heat of the Sun (阳光灿烂的日子) (1994) and Bryan Singer’s The Usual Suspects (1995). In both of these earlier films, the majority of the narrative is ultimately revealed to have been a fabrication inspired, in each case, by fleeting glimpses of unrelated objects (a photograph in the first film, and a series of office paraphernalia in the latter), and similarly the opening monologue of Suzhou River introduces, in a discussion of the “legends, stories, memories, and garbage from the past century” which one may find in the famously polluted river, the specific examples of “a woman leaping to her death from a bridge, and the corpses of a pair of young lovers being pulled from the river by policemen”—which, together, provide the core of the embedded Mardar/Mudan narrative. The conclusion of the film appears to suggest one plausible explanation concerning the relationship between these Mudan and Meimei, but Mudan’s name suggests another, very different, explanation. More specifically, Mudan’s name literally means “peony” (suggestive of the stick-on peony tattoos she wears on her inner thigh), and evokes the title of one of the most famous plays in Chinese literary history: Tang Xianzu’s sixteenth century classic, Peony Pavilion (牡丹亭) (coincidentally, perhaps, contemporary director Chen Shizheng’s 20 hour version of the full 55 act opera—billed as the first complete performance of the work in over a century—premiered in Lincoln Center in 1999, a year before the release of Lou Ye's film). The main plot of Tang Xianzu’s opera, furthermore, is suggestively similar to that of Suzhou River. Tang's opera centers around the figure of a young woman named Du Liniang, who meets her lover, Liu Mengmei, in a dream, and then wastes to death due to her inability to meet him in real life. Before she dies, however, she draws a self-portrait, and it is this self-portrait which Liu Mengmei finds after her death. He becomes infatuated by her image and, in a sense, it is the force of that infatuation which enables him to literally bring her back to life. The basic narrative structure of Suzhou River, meanwhile, is rather similar. In the latter work, the male protagonist also meets a young woman (Meimei) whom he perceives to be a double or copy of another women (Mudan) whom he had loved but who may now be dead. It is, then, the force of his desire, as mediated through the willing intermediary of Meimei, which makes possible Mudan’s return from (apparent) death—in the sense that it is Meimei’s uncanny resemblance to Mudan which inspired Mardar to tell relate to her the story of his relationship with Meimei, which then becomes the basis for the embedded narrative as it is replayed on screen. Of course, Mardar’s act of using Meimei as a figurative screen onto which he then projects his memories of the (presumptively) dead Mudan is also reminiscent not only of Tang’s Peony Pavilion, but also of a somewhat more recent classic: Hitchcock’s Vertigo (1958). Vertigo’s protagonist, John "Scottie" Ferguson (James Stewart) also falls in love with a woman (Madeleine) whom he has been hired to follow, who then (appears to) commit suicide. He subsequently meets, and falls in love with, another woman, Judy, who bears an uncanny resemblance to Madeleine (both are played by Kim Novak). Still captivated by his memory of Madeleine, Scottie uses Kim as a figurative screen against which to bring back to life the “Madeleine” of his memories (at one point literally attempting to remake Kim in Madeleine’s image). Lou Ye’s indebtedness to Hitchcock’s earlier film is well-known, but I would go further and suggest that the shared plot-lines of both films function more generally as a compelling allegory for the relationship between Hollywood and recent Chinese-language films such as Suzhou River. That is to say, many viewers approach these Chinese-language films through the lens of an increasingly hegemonic Hollywood model. A large part of the enjoyment of these Chinese films, therefore, arguably derives from the viewer’s projection onto the film a model of enjoyment derived from standard Hollywood fare. This may function, for instance, through an attempt to view the Chinese films as an imperfect mimicry of original Hollywood models (the same way that Meimei and Kim are perceived as imperfect substitutes for Mudan and Madeleine) or, conversely, through an appreciation of the Chinese films precisely for the ways in which they diverge from those same Hollywood models. The implication of this allegorical reading of Lou Ye’s film, therefore, is that, as Chinese cinema enters a global marketplace, it becomes increasingly trapped within a dialectic of mimicry and opposition, wherein it is viewed, and appreciated, through the normative lens of the Hollywood models against which it is inevitably compared. Under this reading, the possibility of an internationally successful Chinese cinema which somehow manages to sidestep this dialectical logic becomes as elusive as the blind Baji dolphin—one can not definitively rule out its existence, but its future appears at best rather dire. I love suzhouhe so much!! and Beijing bicycle, Hongkong Holleywood by Fruit Chang, i think louye is a good director.